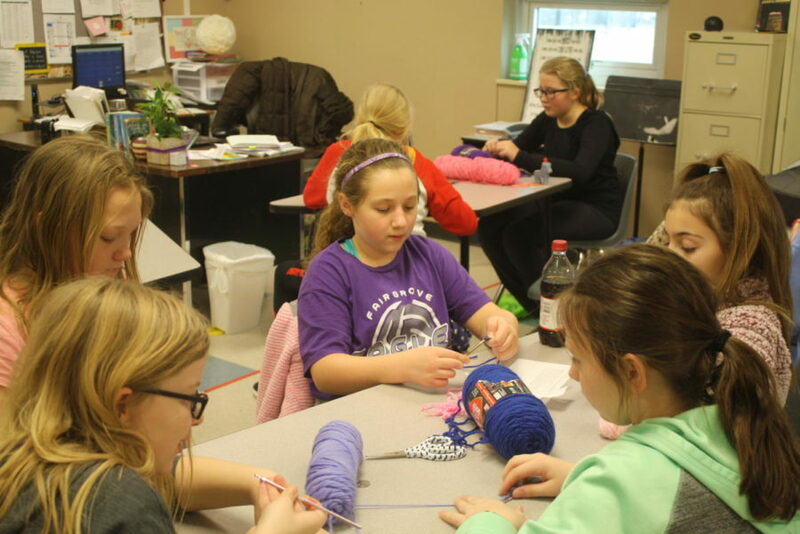 Fair Grove Middle School has an array of after-school activities; however, not many people know a lot about Crochet Club. Around a decade ago, Colleen Appel, a retired Fair Grove English teacher, came up with the idea to implement the club into Fair Grove’s extracurricular activities. In order to start the club, she had to receive the principal’s and the parents’ approval, she had to generate interest within the school, and she had to gather supplies in order for the club to be able to start crocheting. After she achieved this, the club officially started. It is apparent that the club means a great deal to the students. Obviously, there is a wide range of talent and skill level, which is why some of the more experienced members find YouTube tutorials in order to help each other; furthermore, helpers such as Marilyn Meals come and assist the students with their projects. Some examples of the numerous projects that they create are Christmas ornaments, Valentine’s Day hearts, bracelets, baby hats, blankets, pet pads, scarves, and blankets. The time it takes to complete a project varies immensely. For instance, bracelets can take one to two sessions, while a blanket can take most of the year, if not the entire year. Furthermore, the students are encouraged to crochet crafts for numerous non-profit organizations. Some of the organizations that they donate to are CARE, Newborns in Need, and the American Heart Association. Crochet Club’s meetings are held for an hour every Friday after school in Jennifer Anglen’s room (MS 14). If someone would like to be a part of the club, a one-time due of three dollars is required; the dues help pay for yarn and other materials that the club uses on a regular basis. All in all, the club would like to have some experienced and willing individuals (who can knit and sew) to come after school and share some of their previously made textiles, as well as some of their skills with the students.